OnePlus, the maker of the much-anticipated "flagship killer" for 2014 (the OnePlus One), is surely prepping a successor to its device for 2015. Well, we are not entirely sure if it will end up being called OnePlus Two, OnePlus One Two, or whatever combination between "one" and "two" you can think of, but we've already heard a number of rumors regarding this mysterious successor. Frankly said, the naming of the device is not as intriguing as the hardware that will be put inside it. Hopefully, we have some new information about the purported hardware of the smartphone. This time, the beans have been spilled by Coolicool, one of the re-sellers of the OnePlus One. As per the rumor mill, he revealed that the OnePlus One's successor will come with a Qualcomm Snapdragon 805 chipset (we hope that this doesn't turn out to be entirely true, as the upcoming Snapdragon 810 will make the phone a tad more compelling), a 5.5-inch display with no word on whether we'll be treated to a pixel-dense Quad HD one or OnePlus will put its faith into a 1080p one once again. The rumors put 32GB of internal storage inside the phone, as well as a 3,300mAh battery at the rear, slightly bigger than the 3,100mAh one of the OnePlus One. What's more, the handset might end up with a 16MP main camera and a 5MP front-facing selfie one. 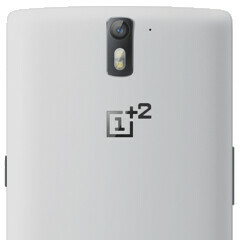 According to the reseller, the OnePlus One's successor will come to surface in Q3 2015, in line with the rumors we've had heard prior. Hopefully, its maker will ditch the invite system for good. There's also no word if the OnePlus Two will come with CyanogenMod or OnePlus will equip its second phone with the in-house Android 5.0 Lollipop ROM that it's reportedly working on as we speak. thought that the phone would be smaller with 5 inches.5.2 was too big for me to handle as a phone. Hopefully they also make a WHITE version of the larger GB memory format, cause not everyone likes dark colored phones. This is hilarouos. Some guy in China speculates on specs, the Engluish language sites report on it after Google Translating from Chinese , some minor retailer that ships worldwide lists those specs, others pick it up, you report on them and finally Chinese sites report on your article. And it all turned from speculation to leak in the mean time. Q3 of 2015? By that time people already bought m9, s6, z4, and iphone 6s. They seem to want to be a special brand that sells tiny bit of phones to a small marketshare that likes phablets (10% of all smartphones are phablets). If they had any brains they would go with two models to make happy most of users. Anyway with their limited invite system they will never make a name in phone industry because unless you are a tech geek, a one thats really into phones you will never hear about oneplus. Fzacek - The first phone was a failure why, because you couldn't get one? The phone and OS is a BRILLIANT feat of engineering, best phone I have ever used, and a complete success!